Once the seam has been accurately cut, remembering that this type of welding should not be considered as gap filling, the seam can be welded. 2. 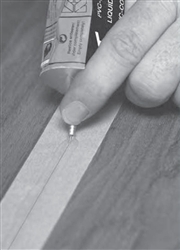 Cut through the tape at the seam, using a utility knife with a sharp blade. Apply the welding liquid, as per the manufacturer’s instructions, ensuring both hands, are controlling the tube. Keep fingers away from the needle applicator. 3. After approximately 10 minutes and once the welding liquid has cured, the masking tape can then be removed.